Drakes Bay Oyster Company, the last operating oyster cannery in California, is currently fighting the federal government to retain the right to farm oysters in the protected marine waters of Pt. Reyes National Seashore. It’s a big local story that’s got everything: a family struggling to hold on to their farm and livelihood pitted against big government allegedly over-reaching its bounds. For those who have followed the news swirling around this controversy since last fall, I may seem late to the party. For those who have not, let me recap. On November 29, 2012, Department of the Interior Secretary Ken Salazar announced that a special use permit allowing oyster cultivation in Drakes Estero, would not be renewed. The Estero is a federally protected marine wilderness habitat in West Marin County’s Point Reyes National Seashore, which prohibits non-recreational commercial business within its boundaries. The decision effectively ends three generations of family run oyster farming in the pristine waters of Drakes Bay dating back nearly a century. When the Point Reyes National Seashore park was created in 1972, the National Park Service initially granted a 40 year lease to the Johnson family, then owners and operators of Johnson’s Oyster Farm on the Estero. The lease permitted their established mariculture operation in Drakes Bay to continue until November 30, 2012. In 2004, the Johnsons sold the oyster business to the Lunny family who renamed it Drakes Bay Oyster Farm. The new owners hoped to persuade the Department of the Interior to extend the existing lease, making a strong case for continuing the sustainable family run farm operation as part of the historic legacy of “working agri-landscapes” that occupied the Point Reyes peninsula before its designation as a national park. With thirty full-time workers, many of whom live on the property, the farm is currently the second largest employer in the Point Reyes National Seashore. Oysters harvested from Drakes Bay make up nearly 40% of California’s yearly shellfish production, some 500,000 pounds of oyster meat annually, marketed exclusively in the Bay Area. The farm is also the last operating oyster cannery in the state. Outspoken opponents of the extension, including the National Parks Conservation Association, Environmental Action Committee of West Marin, and the Sierra Club, cite current land use contract laws put in place to protect marine wilderness areas in our national parks for future generations. These agencies, and others, have expressed concern about the potential environmental impact of allowing the farm to continue cultivation in the sensitive Estero habitat. In response the Lunny family argues their sustainable operation makes every effort to protect the wildlife and ecosystems of the Estero, provides needed jobs in a depressed local economy, and enhances the experience of park visitors by offering educational tours to the public. They allege the National Park Service adversely manipulated the science used to report the mariculture operation’s impact on the Estero. The Lunnys and their supporters held out hope that an appropriations bill, introduced by Senator Dianne Feinstein, would extend the existing lease for ten more years and allow mariculture to continue uninterrupted in Drakes Bay. Secretary Salazar’s announcement on November 29, 2012, effectively put an end to that hope. The family was put on notice and immediately ordered to stop all “non-conforming” uses, close their operation, and vacate the Estero within 90 days. In response, the Lunnys filed suit in the U.S. District Court in San Francisco on December 3, 2012, challenging the decision and seeking an injunction to block the eviction. The court room was packed with disappointed Drakes Bay Oyster Farm supporters when U.S District Court Judge Yvonne Gonzales Rogers initially rejected the appeal and upheld the original cease and desist order on January 25 of this year. Undaunted, the Lunnys took their plea to the 9th Circuit Court of Appeals which finally granted a temporary injunction a month later. The win allows the farm to stay open pending the outcome of the appeal. There’s a lot at stake. If they lose, the Lunnys will be forced to demolish buildings, remove and destroy an estimated $4.5 million worth of oysters, and put 30 people currently employed at the farm out of work. The family is gearing up for the fight of their lives, but they are not alone in the battle. Washington D.C. based non-profit Cause of Action, a non-partisan government accountability group, is providing an ardent defense on their behalf. Lunny has also amassed impressive support from the local agriculture community and a host of others who believe the small family farm is getting a raw deal. The court’s decision is expected to set a precedent. Many will be nervously watching the outcome of the appeal, particularly those currently operating businesses under similar leases on federal lands. To raise money to defray ongoing legal fees, the oyster company recently announced a benefit to be held April 1, 2013 from 6:00-9:00pm at Lagunitas Beer Sanctuary in Petaluma. The “Quaff a Brew & Shuck a Few” event featuring music, food, silent auction and more, promises 100% of proceeds raised will go to save Drakes Bay Oyster Farm. 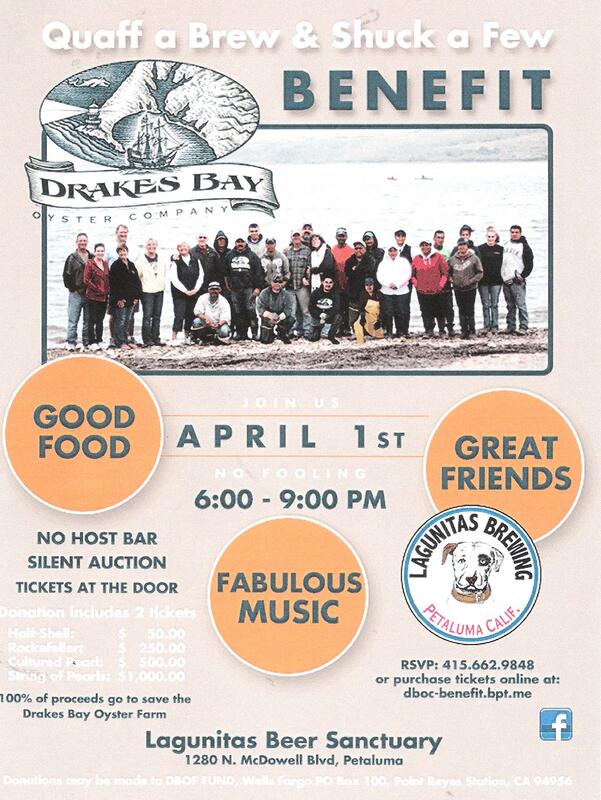 For more information or to buy tickets, visit www.dboc-benefit.bpt.me and type in Drakes Bay Oyster Farm Benefit. Donations may also be made to the DBOF FUND, Wells Fargo Bank, P.O. Box 100, Point Reyes Station, CA. 94956. For updates on the appeal, visit www.drakesbayoyster.com . Here’s hoping the Lunnys find a pearl at the end of this battle!